Download your free demo version of Logbook and and the Add-ons Biography, BoardCash, Inventory, First-Aid Kit, Crew, WorldEnsigns, Scheduler and Maintenance. The test version of Logbook Suite 1.4 includes all functions of the full version, but is limited to 5 travel days and 2 trips. The test versions of all Add-ons are limited to 9 entries. f we have conviced you, you can pruchase the licenses for Logbook or one of our Add-ons in our online shop and convert your demo version into an unlimited full version. 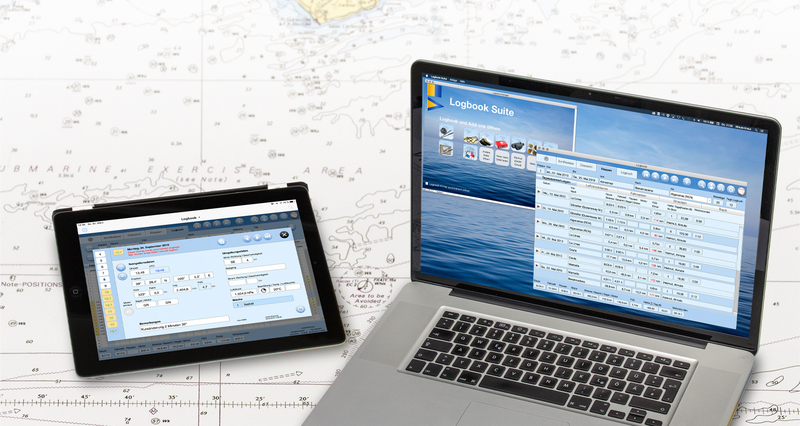 The Logbook licenses for Mac and Windows allow the use on the iPad as well. The license for iPad allows the use of Logbook only on the iPad, not for the PC. An upgrade to a full PC version is possible at any time. The Add-ons can be used with only one license both on the PC and the iPad (BoardCash additionally on the iPhone). You can download the iPad version of Logbook Suite directly from the Apple App Store. incl. Biography, Scheduler, BoardCash, Inventory, First-Aid Kit, Maintenance, WorldEnsigns and Crew. (You need to fill out a form to get the download link. Before selecting the desired user manual tap on Open in Safari on the bottom left of the window. Now select the user manual by tapping on the icon in Safari. This opens a new browser window which shows the user manual. To save the user manual on the iPad, tap on the manual and then tap on Open in… in the top left. Now select the application you want to use for reading the user manual in the popover and wait until the manual is completely loaded onto your iPad.